There’s no question that lack of quality pitching has been the biggest issue for the Red Sox in 2016. But there’s another problem that’s been looming over this team all year and has been especially magnified in the last week. The Sox have been helpless this year in late-inning clutch situations on offense. Notice how I specified “late-inning” clutch situations because they’ve had no problem coming back from deficits early in games, and if you’ve watched the Sox this year you know that there have been plenty of deficits to overcome in the early innings thanks to bad starting pitching. But if this team is down by any margin heading into the eighth or ninth innings, it’s game over. At least that’s been the case through the first four months of the season. The 2013 Red Sox, who won the World Series, had 11 walk-off hits throughout the course of the regular season. Four months into the year, the 2016 Red Sox only have two, and it’s certainly not because of a lack of opportunities. There have been numerous occasions this year where the Red Sox have gone into the eighth or ninth inning tied or down by three or less runs. In some of those situations, they’ve even loaded the bases with no outs and managed to push across just one run or failed to score at all. After winning six out of seven heading into the All-Star break, the Sox picked up right where they left off after the five-day vacation. They grabbed two out of three at Yankee Stadium, swept the NL West leading Giants in a two game series at home, and then dominated the lowly Twins 13-2 at Fenway last Thursday night. All-in-all, they had won 11 out of 13 games and taken hold of first place in the AL East. Then on Friday night, the issue of not coming up with clutch runs in late innings brought the streak to a halt. The Sox went into the bottom of the ninth down 2-1. After loading the bases to start the inning, David Ortiz grounded into a double play and Hanley Ramirez lined out to right field to end it. This was a situation where you’re basically being handed a walk-off but somehow manage to not pull through. I was at the game and it was incredibly frustrating to watch. The next night, they went into the eighth inning down 11-9. After failing to score in the eighth, the Sox were sent down in order in the ninth as Brock Holt, Dustin Pedroia, and Xander Bogaerts failed to reach base against the Twins’ Brandon Kintzler. In Monday’s loss to the Tigers, the Sox went into the eighth inning down 4-1. After once again loading the bases with no outs, they managed to push across just one run on a single by Sandy Leon. Then in the ninth, down by two runs, the heart of the order failed to come through again. Pedroia struck out, Bogaerts popped out, Ortiz grounded out, Sox lost 4-2. 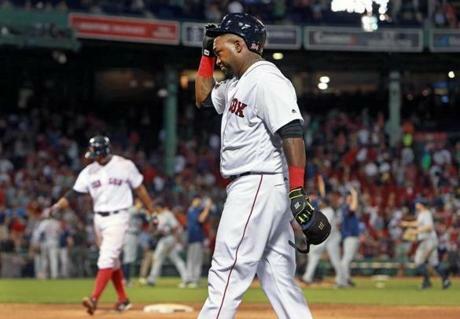 On Tuesday, the Red Sox tied the game 8-8 in the sixth inning but failed to score in the seventh, eighth, and ninth. Heading into the bottom of the ninth down by one run, they had the heart of the order coming up once again. It was deja vu as Pedroia, Bogaerts, and Ortiz went down in order for the second night in a row to close it out. Most recently, there was Wednesday afternoon. After tying things up in the eighth on a Mookie Betts triple, the Sox failed to score in the ninth, allowing Miguel Cabrera’s solo homer in the top of the inning to be the deciding run. They came into the bottom of the ninth down 4-3 when Bogaerts struck out, Ortiz lined out, and Jackie Bradley Jr. flied out to end the game. When I say the Red Sox are being handed walk-off opportunities, I mean there have been FIVE instances in the LAST WEEK where they’ve gone into the ninth inning tied or down by two or less runs with their BEST HITTERS coming to the plate and they failed to come up with anything. As much as we love Big Papi for all the clutch hits he’s produced over the years, he came up in four of those five ninth innings and was retired each time, including grounding into that huge double play with the bases loaded and no outs on Friday. As much as we love Dustin Pedroia, he came to the plate in four of those five ninth innings and reached base once. The frustration with him is starting to show as each time he gets out in a big situation he slams his bat or his helmet on the ground in disgust. As great as Xander Bogaerts has been this year (fourth best average in the AL) and as clutch as he’s been so far in his career (four walk-off hits at age 23), he batted in three of those five ninth innings and was retired each time. As great as JBJ has been this year, as great as Hanley has been in flashes, and as reliable as Brock Holt has been the last couple years, none of them could help the Red Sox out in the ninth inning this past week. So while the pitching staff deserves the brunt of the blame for any shortcomings the Red Sox have experienced this year, it would be helpful if we could get some late inning magic and steal a win every now and then. Over the last few years, and especially since the arrival of Ortiz, we’ve become so accustomed to late summer nights watching the Sox mob one of their teammates on the field after driving in the winning run. That aspect of the game has been missing this year and it’s starting to hurt the team. They’ve now lost five out of six and have dropped to third in the division. All five of the losses were winnable in the ninth inning. Previous Can We Finally Admit That David Price Was A Bad Signing?